Pete Sampras talks rivalry with Andre Agassi, Roger-Rafa and more ahead of 2015 U.S. Open. Twenty years ago it was about the rivalry—Andre Agassi vs. Pete Sampras. Two distinctly different players. Two opposed personalities. One-two in the world and poised for a U.S. Open run. It was then, in 1995, that Nike created a commercial that celebrated this rivalry by having the two American champions race around New York City in a taxi, stopping to flash-mob a tennis court in the street. The commercial celebrated tennis in America. In New York City. 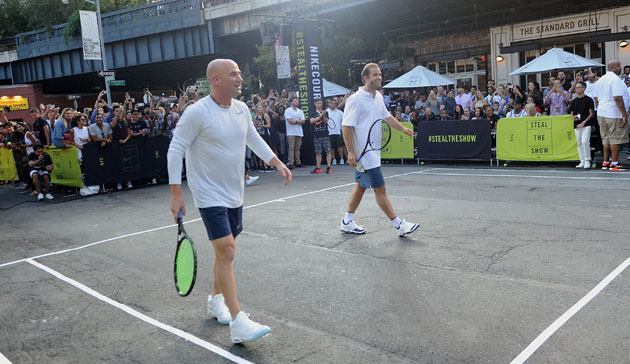 Nike set out to recreate that iconic moment on Monday evening, turning a section of street in the meat packing district near Manhattan’s High Line into a pop-up court and staging a street tennis exhibition featuring such stars as Serena Williams, Roger Federer, Maria Sharapova and Rafael Nadal, along with Nick Kyrgios, Genie Bouchard, Madison Keys, Grigor Dimitrov and John McEnroe (as, naturally, an umpire). ​Of course, just as they did 20 years ago, Sampras and Agassi arrived in a cab to recreate the moment and perhaps revive an old rivalry. During a break in the filming, Sampras took a moment to reflect on these two New York moments and how things have changed in tennis in the two decades between them. The original commercial, directed by Spike Jones, was “one of the best commercials I’ve ever been a part of,” Sampras says. The result? “It was such an iconic moment in tennis and it transcended the sport for a while there,” Sampras says. While Monday’s event was more about a group of athletes, 20 years ago it was about the rivalry. Sampras says he looks forward to the day when an American rivalry returns, adding that the Roger-Rafa rivalry has proven the most interesting in recent years. As we watch the next rivalry take shape and await New York’s tennis major, Agassi and Sampras reminded us of an original American tennis rivalry. One celebrated in the streets.